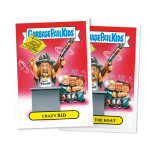 Yesterday Topps official Facebook page teased a GPK announcement for today. 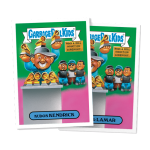 Many people were hoping for Chrome OS 3, and expecting the next full GPK set. 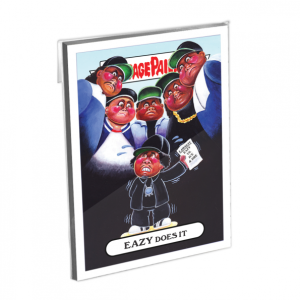 However, Topps went in another direction and announced the online exclusive Rock and Roll Hall of Lame set. Like the previous Not-Scars and Shammys sets the cards are only available online. The 20 card set features GPK parodies of various music acts. The 10 different subjects are available in separate 2 card a/b sets for $9.99, while the entire 20 card set can be purchased for $49.99. There is some confusion as to how long the cards will be offered. 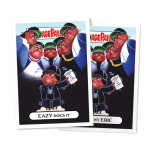 The cards for Rick Carlos state they will be on sale until May 2nd, while the remaining cards sate they will be on sale until the Rock and Roll Hall of Fame special airs on HBO, which is scheduled for April 30th. This is a change from how Topps has previous been selling the Apple Pie online sets usually giving a 24 hour window. However like the previous sets Topps states the print run will be announced via their Topps Blog. Here is the complete checklist along with pictures of the artwork. This entry was posted in 2016 GPK Pie, Topps.com and tagged 2016 Pie, Topps.com by Jeff. Bookmark the permalink.